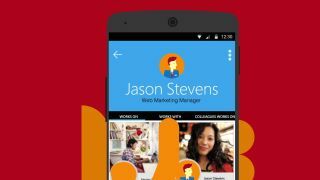 Microsoft released new Office Delve apps for iOS, Android, and Android Wear users. With the Delve app, users will be able to see the shared files that their colleagues are working on, receive updates of any changes to documents and collaborate on ideas from their mobile devices. Delve shows information in a card-based UI, similar to Google Now. Delve integrates with content from Exchange, OneDrive for Business, SharePoint, and Yammer, with more content sources coming soon. As a social platform for work projects, Delve leverages new improvements in the Office 365 profile experience that allows users to learn more about people in their organization and share information about themselves. "The more you and your colleagues work together, by viewing, editing and sharing each other's documents, the more useful Delve will be for all of you," Microsoft said of Delve. "Delve learns from how you and your colleagues work, and tailors the information to each of you. What you see in your views in Delve is different from what your colleagues see in theirs." There is a new people-based search and discovery feature that tells you more information about your colleagues, so you can seek out the right talent in your organization to work and collaborate on new projects. Delve shows their contact information, their projects, their role in the organization, their blog and what's trending around them. Delve is optimized to show search results on different screen sizes, from small four-inch displays to large tablets and notebooks. Blogs on Delve are integrated with Yammer, Office 365, OneDrive for Business, and Office 365 Video. Users can embed files from OneDrive, Office, or Office 365 Video in their Delve blog posts, and pages can be directly posted to Yammer. The Delve app is available to iOS and Android users, and from Microsoft's video, there is also integration with Android Wear smartwatches. The apps alert users with notifications whenever any changes are made. Delve requires iOS 8 or Android 4.4 or later. Microsoft says that it is working on a Universal Windows app for Windows Phone owners. Microsoft has updated its Office 2016 for Mac Preview on Wednesday, a month after the software initially launched. The update adds features like macro recording, meeting time suggestions and Analysis ToolPak support to Microsoft's productivity suite to OS X users as well as some visual changes. Update notes for Office 2016 for Mac Preview reveal improvements to Word, Excel, PowerPoint, and Outlook, including better VoiceOver accessibility support. In Word, Microsoft has improved scrolling performance and keyboard shortcuts. Word for Mac now supports the most popular keyboard shortcuts from Word for Windows with the latest Office update. New to Word are a macro recording feature, search feature for templates online, custom dictionaries and user information settings in program preferences. New Analysis ToolPak and Solver features are bundled in the Excel update. The Analysis ToolPak is an add-in for Excel that allows users to perform complex data analysis, while Solver helps users solve what-if problems by targeting specific cells to find their optimal maximum or minimum values, or subject them to constraints. Those who use Outlook will now see a Propose New Time feature for meetings. "Meeting attendees can propose a new time for a meeting, and meeting organizers can view and modify meeting proposals and send updates," Microsoft said of the feature in its release notes. There are also new networking improvements for Exchange accounts. Office 2016 Preview is a free download and does not require an Office 365 license. The update is available from Microsoft AutoUpdate for Mac.